Simon Farnworth treats Tom Barkhuizen at Oxford on Saturday. 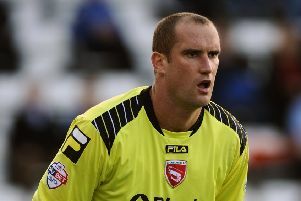 Morecambe boss Jim Bentley is set rotate his squad for Luton’s visit to the Globe Arena on Tuesday night. The 0-0 draw at Oxford on Saturday was the start of a run of five games in 14 days with Bentley ready to shuffle the pack. Tom Barkhuizen and Laurence Wilson also limped off at the Kassam Stadium meaning some changes might be enforced on The Shrimps boss. He said: “It (making changes) was always going to be the case win, lose or draw on Saturday. “These lads have put in a lot of work recently. “It is about a squad and we picked up a couple of injuries on Saturday but whether we had them or not I’d be shuffling the pack. “There are players chomping at the bit to come in and it’s not as if we’ve got 13 or 14 good players and five or six below that. “If I left one out and brought one in it wouldn’t change anything. After a stuttering start Luton’s form is improving with John Still’s men having won four of their last five in all competitions meaning they sit 16th in League 2. Bentley said: “They’re a big club at this level. “They’ve had a bit of an indifferent start but that’s football and it happens. “We’ll expect a tough game. They’ve got some players who are better than the level, certainly in the likes of Craig Mackail-Smith. Tuesday night is set to be the last game of goalkeeper Kieran O’Hara’s loan spell from Manchester United. The teenager has acted as cover for Barry Roche after Tony Thompson dislocated a finger in training.